Merge is a very simple graphic utility for overlaying two images or text in any relative position prior to saving to a file. You can merge the two images in different ways as well as smooth blending in of just part of an image to the final result.There is a batch merge feature which is useful to watermark all of your favorite pictures. Merge also allows text entry of any size, font and color to be merged with an image. • Merge whole pictures with adjustable blending modes. • Rotate either or both ‘source’ images before merging them. • Batch Merge files with a single image – useful for watermarking your favorite images. • Type up or paste in text of any font, size and color and merge it with an image. • Smoothly blend in just part of a source image to the final result. • Copy back the merged result back to a “source” image and rescale or reposition it for remerging. This results in ineresting effects. • Generate surreal effects on the final image. • Set any relative positioning of the images on top, side by side or overlapping. • The image formats for loading and saving are BMP,JPEG,PNG,TIF,TGA,PCX. • There are new surreal image generating features. • A new “highlight” feature that allows brightening or darkening of the image towards an edge or corner. • Easier way to adjust brightness and contrast. 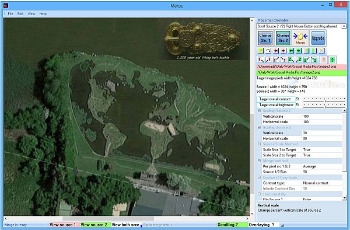 • More visual clues present of the state of merge particularly scrolling of both sources or an individual source image. • Now can generate a grid of geometric shapes (circles, squares, diamonds) for a single source image. • Now possible to load in only one source image. Useful to apply effects to one image only.